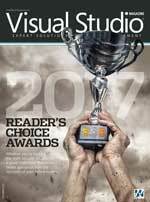 For the 24th year, Visual Studio Magazine has published the results of its annual Reader’s Choice Awards. The 2017 winners are chosen by the readers of Visual Studio Magazine and honor the best Visual Studio- and .NET Framework-related tools and services in 36 categories. The awards are based on the responses of hundreds of Visual Studio Magazine readers who received an e-mail invitation to participate in an online ballot earlier this year. The editors of Visual Studio Magazine sifted through more than 400 products and services to compile the results and award Gold, Silver and Bronze badges in each category. Readers voted on solutions ranging from individual component collections to full-fledged frameworks in categories that span the gamut from security solutions to Web hosting to developer training. We also asked a series of open-ended questions, touching on topics such as the most highly valued development tool, data-centric development tool, mobile dev solution and more. Download the PDF to see this year's winners.